Happy Thanksgiving, Enjoy Your Engine Hoist Turkey Deep Fry! In addition to these ten cars and five of these ten deals, we're also thankful we're not working today. 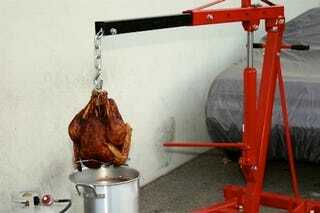 In the meantime, here's Bumbeck's guide to deep-frying your turkey using an engine hoist for the dippin'. Enjoy and be safe!